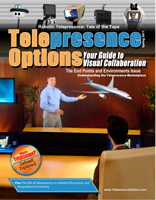 ﻿ Welcome to Telepresence Options Magazine! 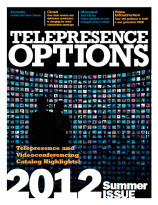 The 2013 Telepresence Options Magazine and Telepresence and Videoconferencing Catalog have arrived! Please click below for your FREE subscription, which includes all of our publications online, as well as hard copies of next year's print publications. If you have already subscribed, please proceed directly to our Online Archive. 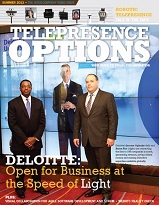 Deloitte: Open for Business at the Speed of Light: An inside look at how Deloitte is connecting to 185 companies a month, generating revenue from their video program, saving their clients money, and making their expertise available globally. The most in-depth look at a Fortune 100 visual collaboration program ever. Business-to-Business Video: How organizations are cutting costs, improving productivity, and enhancing collaboration by connecting with their supply and demand chains. Implementing B2B Videoconferencing - Consider the Ballerina: One of the industry's most sophisticated VNOC architects explains what it takes and provides "news you can use". Business-to-Consumer Video: How video is enabling organizations to connect with customers, enhance their brand, and provide subject matter experts anywhere. WebRTC – A Reality Check: The Telepresence Options team talks to some of the industry's leading players to cut through the hype around WebRTC. Visual Collaboration for Agile / Scrum Software Development: Agile and Scrum are revolutionizing software and hardware development but how do you get everyone on the same page when your teams are scattered across the country or world? Robotic Telepresence: Tale of the Tape 2013 – We compare the new crop of telepresence robots and look at the state of the industry and future trends. The Video Migraine: Videoconferencing Security, Governance, and Business Continuity – One Step at a Time! 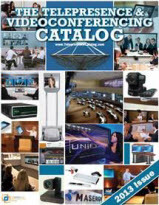 The Telepresence and Videoconferencing Catalog is the world's most comprehensive buyer's guide and sourcebook for visual collaboration solutions designed to empower your workforce, maximize productivity, and help you connect to your customers. 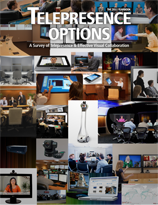 35 Solution Snapshots: Full-page, detailed, product / service overviews including: telepresence environments, videoconferencing endpoints, robotic telepresence, cloud video solutions, mobile video, and much more. Videoconferencing Infrastructure: A Primer: The basics of the "Big Iron" that make telepresence and videoconferencing possible. The Cloud , Videoconferencing, and You: Everybody's talking about the cloud. 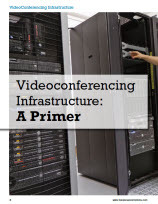 What does it mean for videoconferencing? The Great Debate: The Case for Building Your Own VNOC vs. The Case for Managed Services: A Fortune 500 videoconferencing manager with a VNOC and 500+ rooms explains why they do it all themselves. Internetworking Telepresence and Videoconferencing: Terrestrial, satellite, Internet, and mobile networks for video. Videoconferencing Security: Present and future threats. 37 Solution Snapshots: Full-page, detailed, product / service overviews including: telepresence environments, videoconferencing endpoints, robotic telepresence, cloud video solutions, mobile video, and much more.